The experts are saying that Chinese President Xi Jinping’s visit to India from 17 to 19 September marks a new stage in relations between the two superpowers. It was China’s first top-level visit to India in eight years, and it signifies the two countries’ increasing interest in strengthening bilateral cooperation, which they see as having strategic importance for them. Testifying to that was the signing of three memorandums of understanding and 12 agreements covering trade and investment, industrial and infrastructural development, science and technology, and environmental protection. To meet those goals, China pledged $20 billion to India within five years, enabling Chinese investors to fortify their position in the growing Indian market and allowing India to obtain the financing it needs to modernize the country. In addition, India was promised $33.6 billion from Japan, where Prime Minister Narendra Modi traveled for an official visit ahead of Xi’s arrival. According to Modi, developing business cooperation with Japan will help India strengthen its bargaining position with China, which regards Japan as its chief competitor for cooperation with India, and additionally attract foreign investment to the country. All told, Chinese and Indian businessmen signed agreements worth $3.4 billion, and agreed to increase trade volume between the two countries to $100 billion by 2015. The rapprochement between India and China began just a few years ago and is based on a purely pragmatic approach to their national security. Economic considerations dominate regional diplomacy in this setting. 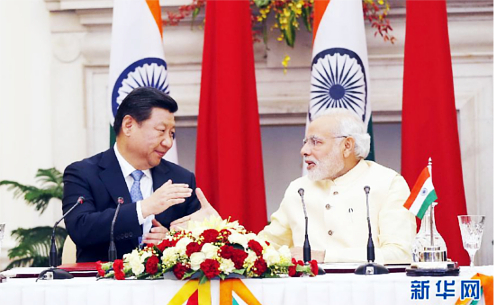 China is India’s primary trading partner. Their turnover in 2013 amounted to $65.5 billion but India came out on the short end of the stick: a deficit of $40.8 billion, as compared with a $1 billion deficit in 2001-2002. Modi intends to correct the situation by signing the new agreements with China which has promised to improve market access for Indian pharmaceutical products and computer technologies. During his campaign, Modi was wagering that India would increase its economic might and strengthening its position in the world, and he was looking to economic cooperation with China as a way to achieve that goal. Modi gives China credit for its economic buildup, and he is striving to transfer its experience to benefit India’s industrial growth. He is primarily pinning his hopes on Chinese direct investment, which in the last 14 years has not exceeded $400 million because of previous policy restrictions. For its part, China needs Indian markets for its output, which is seeing greater demand thanks to the expansion of India’ middle class. China also plans to invest in the resources and infrastructure of India to create new opportunities for expanding industrial production. Prior to Xi’s arrival, Modi declared, “China and India are two bodies but one soul.” And China hailed Modi as India’s Nixon, a man who will raise China-India relations to a new level. Yet in spite of the warm reception Xi received from Modi, the conflict of interests between the two superpowers still exists. The territorial issue in the Himalayas remains unresolved, and the countries are still at odds on cross-border water resources, Tibet and the visa regime. 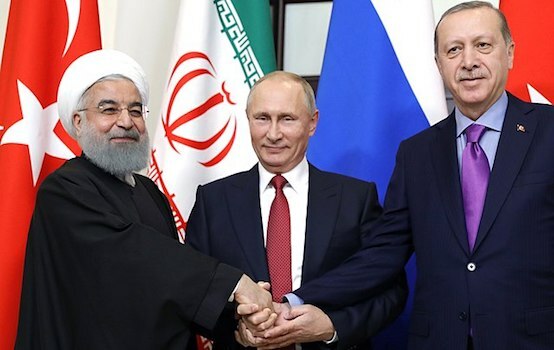 Even so, the main conflict of interests plays out politically in the Asia-Pacific region, and it is linked to each country’s ambitions of political leadership in the region. 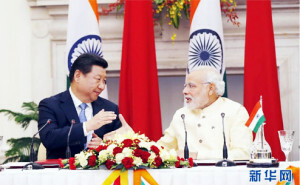 India, whose GDP is only one-fourth that of in China, cannot yet provide genuine economic competition for China in South and Southeast Asia, but the expansion of the Chinese sphere of influence here (on the eve of his visit to India, Xi visited Sri Lanka and the Maldives) causes concern among India’s leaders and is viewed as a threat to national security. Though pursuing a policy of economic rapprochement with China, Modi sharply criticized the country with the “expansionist mindset” while on his recent Japan trip. That was seen by many as a direct reference to China’s aggressive policy in the South China Sea. Indian society retains its distrust and suspicion toward China, as shown by a recent opinion poll. Asked which country poses the biggest threat to India, the vast majority of respondents ranked China second, just after Pakistan. And they might have good reason to think so, if the invasion of Chinese soldiers in the disputed border area and Xi’s visit to India isn’t considered just a coincidence. Since the beginning of the year, China has 334 documented instances of border violations. China, in turn, looks negatively on the latest agreement between India and Vietnam. China and Vietnam have been fighting for control of the Paracel Islands, as joint oil drilling is planned for the islands’ offshore waters. China has let it be known that it considers the agreement to have no legal force because it deals with sovereign Chinese territory. Meanwhile, since signing the agreement with Vietnam, India, which is also strengthening military cooperation with Vietnam, has made it understood that it does not recognize China’s singular claim to the disputed territory. In contrast to his predecessor, Modi is not afraid to follow a policy of rapprochement between countries that are strategic rivals with China for influence in the Asia-Pacific region by leveraging national security interests, which could be threatened by China’s accelerating military modernization and the expansion of its presence in the Indian Ocean. That ties in to India’s willingness to seek alliances with Japan and the United States, where the Indian prime minister made an official visit shortly afterward. 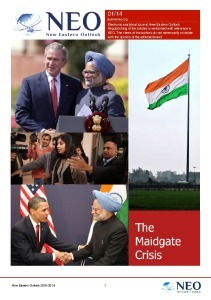 But India is hesitant to join the Japan-US alliance aimed at countering the growing influence of China in the region. And China, which is extremely wary of the emergence of an anti-China coalition in the Asia-Pacific region, openly supports Pakistan. Natalia Rogozhina, Ph.D in political science and a leading research fellow of the Russian Academy of Sciences, especially for the online journal New Eastern Outlook.